Calgary Journal editor Jamie McNamara, left, gives host Ashley King a rundown of social media activity during Oct. 16 municipal election in Calgary. Photo courtesy Kerri Martin. For the Oct. 16 2017 Calgary municipal election, the instructors at Mount Royal University decided to give their students experience covering the event in real time. As the head of video production at the school, I was tasked with the technical operation of a multi-camera, student-produced livestream. The streaming effort was considered both experimental and secondary to the reporting efforts of our large team working across the city and sharing election stories with our audience on social and website channels. 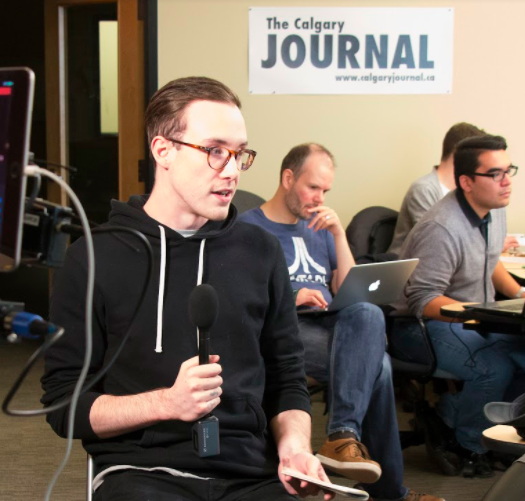 We began streaming at 8 p.m. and went live from the Calgary Journal newsroom at the top of each hour, every hour, until we called it quits after midnight. In fact, very little did. From the start, the professors, the students and I viewed this as a pilot project. We could try things and be flexible with few repercussions. What follows are some insights that other journalism programs might find useful as they integrate livestreaming into day-to-day workflows. For the livestream, we used a new app on two of our iPad Pro 9.7s called Switcher Studio. It’s a subscription-based app that enables multi-camera productions with switching and recording capabilities. In plain speak, for $35 amonth, we found an easy-to-use app — thanks to a recommendation on a MoJoCom Facebook Group — that replicated a TV production control room sans technicians, producers, a big budget, and extensive planning. Switcher Studio came into its own on election night. The intuitive iOS app easily connected multiple students’ iOS devices as camera sources both in the newsroom and around the city, which we then streamed using Facebook Live. In the corner of our newsroom, our production nucleus included 2 iPad Pro 9.7s attached to tripods via sturdy iOgrapher cases. I operated the system while our student host, Ashley King, did debriefs with reporters in the field and in the newsroom. In addition to the 2 iPads, we utilized a few newsroom-based and field reporters’ iPhones throughout the night for bumper shots and live hits. We also used a free iOS app Switcher Cast to use a Mac laptop screen as yet another source from which we could play videos and feed live hits. 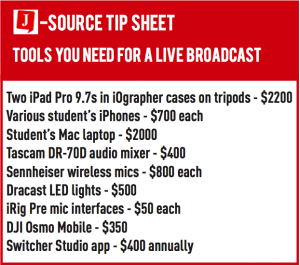 Other equipment used during our live stream included a Tascam DR-70D audio mixer, Sennheiser wireless mics, Dracast LED lights, iRig Pre mic interfaces and a DJI Osmo Mobile. For audio, I mixed two wireless mics and an audio feed from a Mac laptop into the Tascam mixer, with the final mix being sent to the iPad running Switcher Studio. Audio from the laptop included audio from video playback and live hits using FaceTime. The setup made for clean audio. Videos from remote locations were sent to us via Google Drive and Dropbox. I would then download them onto the connected Mac and play them back during the show using Quicktime player. Live hits were achieved by having the field reporter FaceTime to the Mac laptop and then I would call up the audio and cast the screen when ready. To cue the field reporter for a FaceTime live hit, I held up a sheet of paper with the word ‘CUE’ to the laptop webcam and that, in turn, would appear full screen for the remote reporter and they would start talking. It was a low-tech solution that worked well, s we did not have in-ear communication setup. We simply had generic throws and no Q&As between the reporters and host. Battery power was not an issue during the stream as equipment was plugged into wall sockets. Switcher Studio also provided feedback on power levels of all connected devices, which was helpful. Despite testing a few mounts for the iPad Pro, there were some issues because the same iPad was being used to livestream and run the Switcher Studio app. Whenever anyone touched it, the iPad would wobble slightly, resulting in live camera shake. .
Before the live stream, many of the graphics had been prepared, making it easy to bring in lower thirds and titles on the fly, inserted through the Switcher Studio app. I also ran titles between the hourly hits communicating to our audience when we would next be live. We streamed for a total of just over four hours. The rationale was that a longer live-feed would attract more views over time, instead of starting new feeds each hour. The FB livestream failed at the four-hour mark for reasons that remain unknown. Fortunately, the Switcher App both notified me of the failure and prompted me to continue recording. That allowed me to upload the edited recorded content to Facebook after the production concluded. The next day, I edited all six live hits totalling 43 minutes, and uploaded them to the Calgary Journal Facebook page. Our production cost was about $7,000. 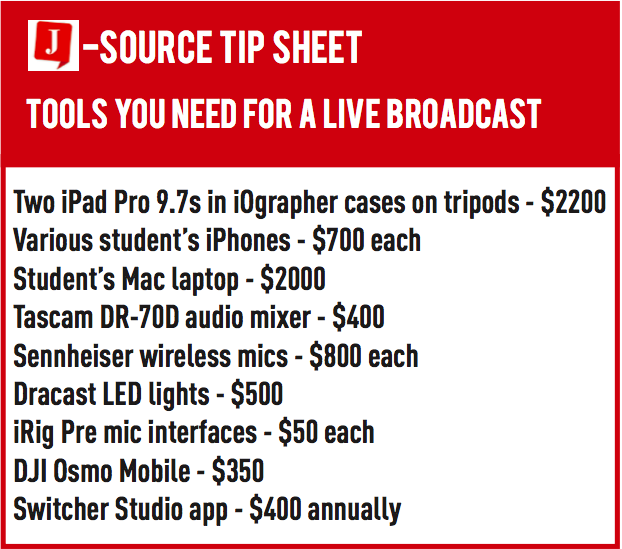 We cherry-picked equipment from our Journalism program rental library, from students, from our Broadcast Media Studies program, plus a few new apps. Ten years ago, a production of this type might have run easily in the tens of thousands owing to the need for multiple technicians, live transmission costs, studio cameras, and other technical and staff supports. Having one technical person (me) direct a show, switch sources, add lower thirds, select transitions and sort camera controls, all while mixing audio, was too much. We should have trained a student to fulfil the role of director/switcher. The director, with a third iPad, could have done all of the switching. This would have minimized technical errors, such as switching to cameras that were blown out, forgetting to use graphics and touching the iPads to the point that they wobbled. No in-ear technology meant limited Q&As between host and remote reporters. Next time, we will consider using a $12 ear piece that would have allowed our host to hear the field reporters’ hits. We also made the decision to run our Facebook livestream all night long. As mentioned, the livestream stopped working after four hours, so we do wonder whether we might have been better off doing shorter segments. We should have also rehearsed using all of our technology, however, coordinating dozens of students from all years of the program made for tough logistics. Overall, everyone involved learned a lot, had fun, and served our audience with a youthful take on the civic election. Jason Kokot is the head of video production, supporting the Journalism and Broadcasting Media Studies programs at Mount Royal University. He runs a Facebook technical support group with a mobile journalism focus for anyone interested. Jason can be reached by email at jkokot@mtroyal.ca.